Friday 14th March 2014, is a date that will always be reminisced by everyone in the border city of Newry in Northern Ireland. That was the day the bookmakers in this sleepy city, padlocked their doors early. The gamble was truly landed by a locally owned and trained Tammys Hill. The pints were on Tammys Hill and James Smyth. 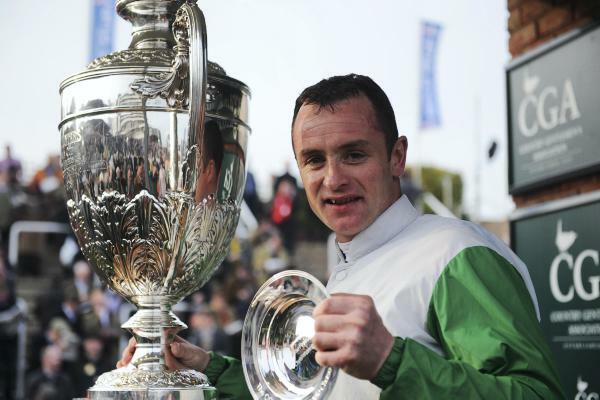 Small-time farmer James Smyth from Poyntzpass on the outskirts of city, rode his family owned horse ‘Tammys Hill’ to win the much sought-after Cheltenham festival Foxhunters Chase. Against all the odds. We caught up with Smyth and he recalled the build-up- to the race and the crazy celebrations after which plenty of pints were raised up in the name of “Tammys Hill”. Tammy’s hill was owned by the Patsy Smith and in training with Newry handler Liam Lennon. From the very start this capable horses career it was crystal clear, Tammys Hill’ was something extraordinary, his first triumph was in Tinahely point to point course on 11th October 2009 with Warrenpoint born jockey Mark O’Hare in the saddle winning by commanding 10 lengths and never out of first gear. Connections of the horse were not at all surprised, as they had a good gut feeling this horse was “a decent one” and Smyth already had a fair idea of his capability, but it certainly caught the eye of a few shrewd judges. Unquestionably the chequebooks were at the ready. The next milestone in the horse’s career was to be taken to the Cheltenham horse sales and considerable figures where offered to connections of Tammys Hill but they turned them down as knew they had a genuinely good horse and that’s something money can’t buy, many of billionaire has tried and failed. The next few years in his star-studded career ‘Tammys Hill’ really started to find his stride and it was clear to everyone why the Smyth family opted not to sell him at the sales, achieving victories up and down the country and without a doubt becoming the best hunter chaser of this generation. Winning most of his qualifiers leading up to the 2014 Cheltenham festival including beating the talented ‘On the fringe’ narrowly in an enthralling race at Leopardstown when the JP McManus owned horse looked the winner but ‘Tammy’s Hill’ really stuck on tenaciously and got through a gap to lead right on the line for a slender victory but one the Smyth family are proud of, hats off to the jockey on this occasion Robbie McNamara who gave the horse a text-book ride. Three days prior to the big race Smyth jogged the course under guidance of experienced jockeys to make sure he knew it inside out and get a real feel for this unique racecourse in which it has many undulating hills and bumps that cannot be seen from the television. Friday 14th March was the date when Tammys hills contested in the highly anticipated Cheltenham Foxhunters chase over a trip of 3 miles two furlongs to a sold out crowd on Gold cup day at the meeting, Smyth jumped off looking for a decent position as there was 25 runners all looking for a nice prominent position but luckily he got right on the tails off the frontrunners with plenty of cover, throughout the race ‘Tammys hill’ was jumping and traveling smoother than most of them, five fences from the finish and Smyth reflected on how he felt to us “I was feeling great and was very self-assured i was going to win, I had plenty in the tank, my fellas jumping was foot perfect”. Two fences from home he disputed the lead with another horse but ‘Smyth’s horse looked full of running, he kicked for home always aware nothing was catching his horse, realistically was home and hosed prior to the rest finishing. After the race the media surrounded Smyth, but he looked his usual humble self, stating to them “I was on the best horse in the field and it was never in any doubt”. After the thrill of the race Smyth drove the horse to the ferry, they then travelled home and got him settled back in his Newry stables , the rest is a blur, as the team celebrated for quite a few days and quite rightly so, it’s not every day you ride your family horse to success in the biggest horseracing meeting in the world. Smyth stated, “I wish I could do it all over again, it was once in a lifetime opportunity and a dream come true for me”. The following year connections decided to take their chance in the Irish Grand national after proving he was as good in handicaps and was entitled to be there or abouts but when traveling well and poised to make his challenge he came to unfortunate grief, coming down and suffered an untimely death in which there is always dangers implicated in jumps racing. Smyth poignant stated to us “the horse owed us nothing , he continuously ran with his heart on his sleeve, he will always be reminisced for all the right reasons”. 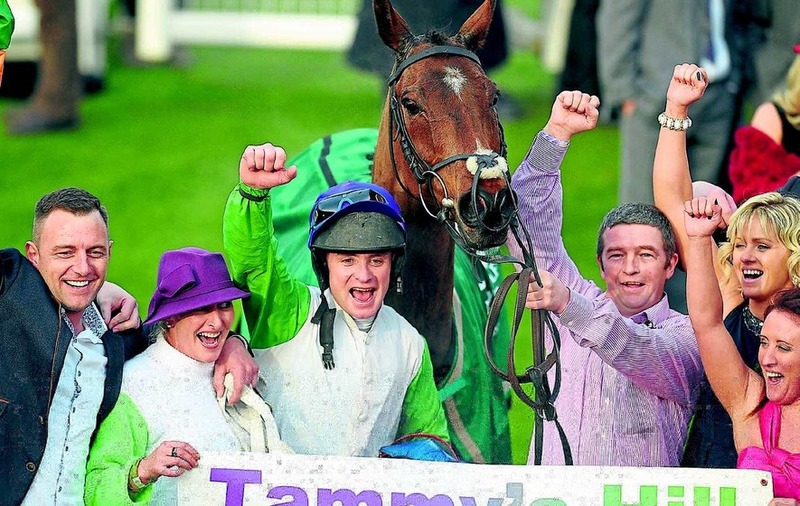 This may be the end for Tammys Hill but he will certainly never be forgotten by myself or the horse racing community and it’s in our imagination we can only dream of the heights this horse could have exceeded to but its certain to say the horse will go down in local folklore as the horse from Newry who took on the big boys at Cheltenham and won”. We are delighted to be hosting a Cheltenham Preview Evening in Newry. Click here for all the details of this unmissable event.